Dear all. may I take this opportunity to reintroduce both myself and my family’s campaign. I am Larry Sherwood-Beckham, second cousin of “peerless” footballer and pant model David Beckham, and the custodian of the Beckham family’s ancestral home, Shell House (picture below). 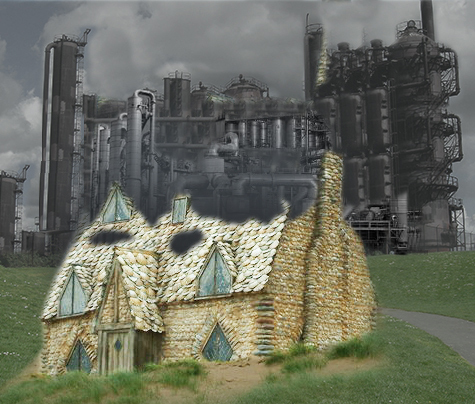 For years the house has stood proudly betwixt the gas works and council estate but it is falling into disrepair. I have tirelessly campaigned for the last couple of years to save it for future generations (so I can charge football fans to see inside the room where young David once slept and dreampt of marine mollusks). Sadly the beautiful whitey-pink-grey dwelling is now almost derelict, mainly due to it being made entirely of porous seashells held together with mud and partly because a few years back faulty microwave blew it’s leaky seaweed roof off. I have tried to get lottery funding and even asked Sports Relief but to no avail as they are very tight-arsed. But dear Beckworth, Shell House is worth saving. It is probably of some cultural importance. This is where cousin David began his lifelong passion for aquatic crustaceans, inspiring many others along the way (I wonder how many of you have posters of David in action on a beach building crude shell sculptures or making wigs and mermaid costumes from seaweed and flotsem and jetsum?). Shell House was originally built by mine and David’s great-grandfather, the seafarer and famed conchologist “Dr” Terence “Terry” Beckham, and was our third favourite after-school destination when it was raining and we wanted to smoke fags. Great-grandfather would regale us of his adventures near the high seas gathering shells and mud to bring back to build his house, whilst “peerless” David ignored him and played keepy-ups in the kitchen. The house is also a unique architectural monument to the ancient, and now lost, skill of building homes with barnacles and wet earth. So come on, please donate handsomely to SLAPDASH (Save Larry And “Peerless” David’s Ancestral Shell House), I reckon £250,000 should do it and after two years we’re only up to £2.76. So dig deep. I’ll be leaving a labelled pot for loose change in the laundrette and public toilets, or you can give it to me in person in the pub (I’m at the bar every night) .